So, Yuri Zhirkov is hinting he could be off in the summer if he doesn’t get a regular starting place. Considering he’s just spent 3 months out injured, I had to laugh when I read that. I don’t get it. 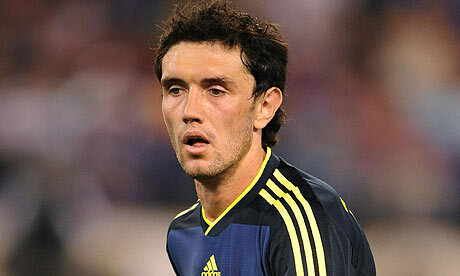 Zhirkov had managed to work his way into the team prior to getting injured. He has been relatively quiet throughout his time at Chelsea. He only said what I think any other self-respecting player would have said under the circumstances. The gutter press once again tries to make a mountain out of a molehill. If you ask me, he injected much more pace into the game when he came on the other night than Malouda had. Personally, I would like to see Zhirkov and Yosi stay around a little longer. Malouda, Kalou and Obi are expendable. We must keep Zhirkov at The Bridge…He has a lot of talent and loves to run at defences…naturally gifted and can cover at left back…he will get better and better with more appearances…. Keep Zhirkov and dump Malouda in the summer…Malouda is 30 and hasnt done a dime this season.